Learning should be fun, hands-on, and student-centered. Using safe, structured curriculum, students will learn the basic ins-and-outs for expressing themselves using metal. I am from California and love surfing, skating, and other sports. That’s why I lead the Extreme Hyde club! 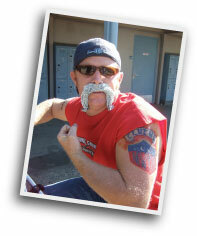 I also love dressing up in fun costumes for Halloween (like me as a tough motorcycle dude). I live with my wife and two kids in Santa Cruz.